Prices shown are for less than 10 pcs, discounts are applied for larger quantities where applicable. If you require larger quantities than shown please contact us for a quote. 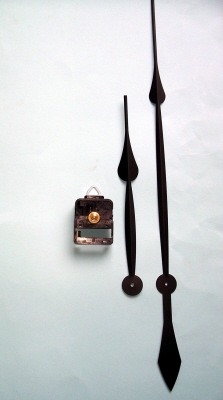 An AA battery stepper High Torque Movement kit, complete with 450mm (minute centre to tip) counter balanced V set aluminium spade hands with eye shaft minute fit. Supplied with fixings and metal hanger. 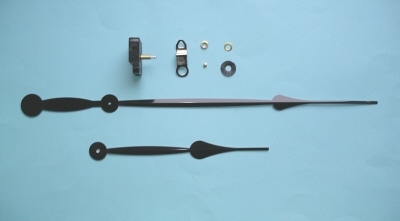 These movements have an extended shaft at 24mm long to allow hands to clear the dial and sold as a complete kit specially for service and repair or making that large clock at a very competitive price. Super High Torque Movement kit complete with approx 450mm (minute centre to tip) counter balanced V set aluminium spade hands. Supplied with fixings and metal hanger. 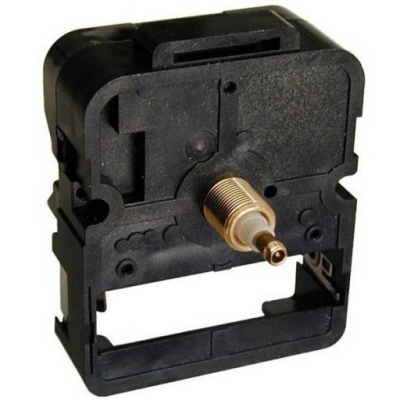 These movements have a sweep motor not a normal stepper motor. The minute hand does not vibrate at the tip as with normal quartz stepper units.They are the most powerful quartz units on the market, does not run a second hand. Super High Torque Movement kit complete with approx 450mm (minute centre to tip) counter balanced V set aluminium arrow hands. 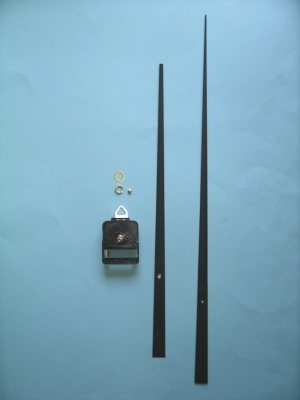 Supplied with fixings and metal hanger. These movements have a sweep motor not a normal stepper motor. The minute hand does not vibrate at the tip as with normal quartz stepper units.They are the most powerful quartz units on the market, does not run a second hand. C Cell High Torque stepper movement. Supplied with fixings and metal hanger. For hands we recommend you use either the 10 inch, 12 inch or 14 inch hands listed below. Not for use with a second hand. C Cell Super High Torque Sweep movement. Supplied with fixings and metal hanger. For hands we recommend you use either the 10 inch, 12 inch or 14 inch hands listed below. Not for use with a second hand. C Cell High Torque Pendulum stepper movement. Supplied with fixings and metal hanger. For hands we recommend you use either the 10 inch, 12 inch or 14 inch hands listed below. Not for use with a second hand. 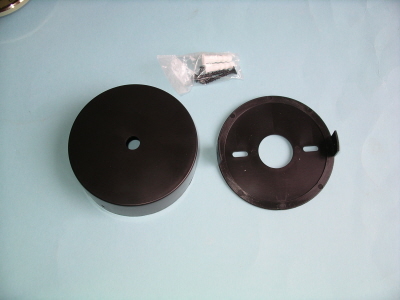 2 Part plastic cup which holds the C cell movements so they can be wall mounted without a dial. ie you use the wall as the dial. Supplied with screws and rawl plugs. 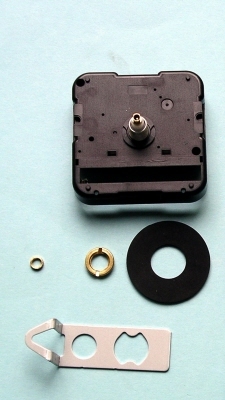 SEIKO HIGH TORQUE SWEEP CLOCK MOVEMENT eye shaft. A powerful very smooth running High Torque Sweep movement with eye shaft minute fitting. 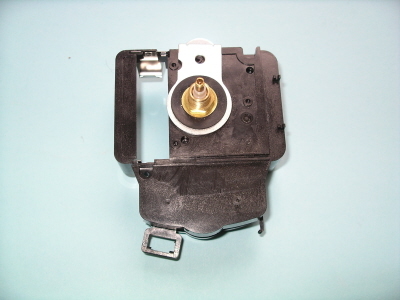 This is the most powerful AA battery Sweep Quartz movement available. Case size approx 57 x 57 x17mm deep. For hands see hands for German eye shaft movements will run a second hand max 125mm long from our list. 2 Part plastic cup which holds AA battery movements so they can be wall mounted without a dial. ie you use the wall as the dial. Supplied with screws and rawl plugs.